Dimensions: H9.5 x W18.5 (cm) H3.7 xW7.3 (inch) LV Josephine Wallet, M60164, i..
Dimensions: H9 x W18 (cm) H3.5 x W7.1 (inch) Louis Vuitton Monogram Brazza W..
Dimensions: H11.5 xW21 (cm) H4.5 xW8.3 (inch) .. 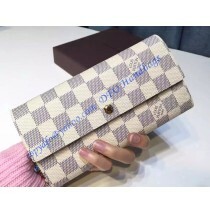 While the new Sarah Wallet gains popularity, there are many Louis Vuitton lovers preferring the old ..
Dimensions: W19.5 x H10 (cm) W7.7 x H3.9 (inch) Louis Vuitton Damier Azur Canvas ..
Dimensions: H11 x W21 (cm) H4.3 x W8.3 (inch) Louis Vuitton Damier Azur Isolite, N6..
Dimensions: H10 xW12.5 (cm) H3.9 xW4.9 (inch) ..
Dimensions: W19.5 x H10 (cm) W7.7 x H3.9 (inch) Louis Vuitton Damier Ebene Canvas..
Dimensions: W21 x H12 (cm) W8.3 x H4.7 (inch) Louis Vuitton Damier Graphite Canva..
Dimensions: W13 x H10 (cm) W5.1 x H3.9 (inch) Louis Vuitton Marie-Lou Compact Wal..
Dimensions: W20 x H11 (cm) W7.9 x H4.3 (inch) Louis Vuitton Marie-Lou Compac..
Dimensions: W10 x H18 (cm) W3.9 x H7.1 (inch) Louis Vuitton Monogram Canvas Colom..
We all know the feeling. You walk into an upscale store and you’re immediately sized up by the clerks to see if you “belong.” It’s not just your hair and makeup they’re inspecting; they check out your outfit, your shoes, your jewelry and the handbag you’re wearing. That’s their way of deciding whether you’re a serious buyer who’s worth their time, or just a casual browser to be left alone. Customer wearing cubic ZC earrings and off-the-rack dresses will never receive the same attention as ones wearing Manolo Blahniks and LV purses. Assuming you pass the test and are helped to make a purchase, there will be one more opportunity for the sales associates to turn up their noses at you. They may take your credit card, but you can be sure you’ll receive a disapproving look if you take that card out of a cheap wallet. On the other hand, pulling a Louis Vuitton wallet from your designer purse will ensure that you receive the respect you deserve. 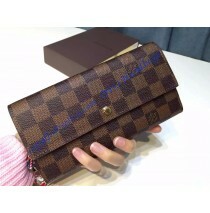 It shows personal style and a level of status guaranteeing that you “fit in.” The experience is no different if you strategically place your “little Louis” on the table in a fine dining restaurant or at a charity dinner; an LV wallet is a statement that you are someone who should be respected, and even admired. These wallets certainly aren’t expensive as LV bags, even if you can find Louis Vuitton purses on sale, but they’ll still set you back many hundreds of dollars. That’s an awful lot to pay for a small accessory that’s usually hidden in a handbag or pocket. Shopping with DFO Handbags is the best way to lessen that financial burden, while still receiving all of the benefits of carrying a Louis Vuitton wallet. Stay with us, and we’ll explain the secret. Louis Vuitton began operations as a design house in the mid-19th century, first creating highly-praised (and expensive) luggage for the rich. The famous “LV” that Vuitton placed on the company’s trunks to prevent counterfeiting is believed to be the first-ever designer logo. It was Vuitton’s son who introduced the house’s iconic Monogram canvas design around the turn of the century, also to make life more difficult for counterfeiters. The atelier’s offerings were expanded throughout the 20th century to include handbags and wallets, first constructed from the famed Vuitton Monogram canvas and then incorporating leather into the designs. In 1959 the canvas was softened to make LV purses and wallets more pleasing and versatile, and the more supple material led to a vasy increase in sales. Throughout the firm’s history, however, a Louis Vuitton wallet, purse or bag was an obvious status symbol indicating wealth and taste. As the design house grew in size and stature, it created bags from a wider variety of canvas and leather, including the stunning and durable two-toned Epi grained leather line released in 1985. “Little Louis” goods like the Epi LV wallet for women quickly became must-have accessories, even for those who had never worn an LV purse. And the luxurious Monogram Empreinte line, first released in 2010, created demand for an entirely new type of Louis Vuitton wallet. Today there’s an enormous choice in canvas, leathers and designs, whether you’re shopping for yourself or are interested in a sophisticated Louis Vuitton men’s wallet. Why is there such demand for these smaller but elegant pieces? It’s partly because many can function as beautiful clutches for everyday use or a night out on the town. More importantly, though, it’s because they’re more affordable than Vuitton handbags yet are still an obvious indication of the owner’s taste, status and attention to style. More affordable certainly doesn’t mean cheap. 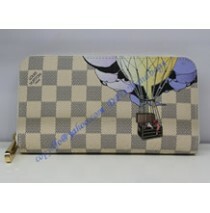 Buying a canvas LV wallet at one of the company’s stores or its website will run you at least $500, while a more extravagant Louis Vuitton wallet can easily cost more than $1000. Some even carry price tags closer to $10,000. That’s a lot to pay for a functional yet small accessory, even if it makes a definitive fashion statement. There’s a smarter alternative to paying top-dollar for a Louis Vuitton wallet for men or women: buying through DFO Handbags. There are so many advantages to purchasing your Louis Vuitton wallet from DFO Handbags that it’s easiest to simply list them. This is the advantage that people find most compelling, of course – because we sell our LV wallets for prices that are often 80% lower than what you’d pay at a Louis Vuitton outlet. We don’t have to pay the huge warehouse, rental store, advertising, marketing or transportation expenses that design houses regularly incur, so we are able to pass on all of those savings directly to our customers. 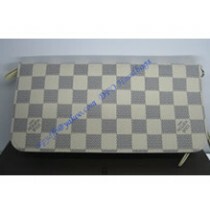 When you shop at the LV website, you’ll have to pay around $600 for a Monogram canvas wallet. When you shop with DFO Handbags, that wallet will cost you a little over $100. That’s why we use the word “compelling” to describe our pricing. Louis Vuitton wallets from DFO Handbags are designed and manufactured to the rigorous standards used by LV craftsmen, from the exquisite, soft and supple leather or canvas to the iconic LV style and markings. 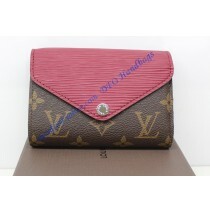 The linings, imprints and hardware are all sheer perfection, and every Louis Vuitton wallet passes through strict quality control inspections before it can be sold. 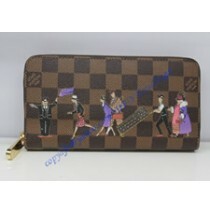 These wallets have the extraordinary quality you’ve come to expect when you buy LV goods. 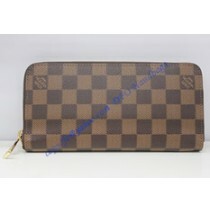 Even Louis Vuitton stores run out of the brand’s most popular products on a regular basis. We don’t. DFO Handbags never puts you in the position of having to accept your second or third choice, since we have an enormous inventory of nearly every LV wallet style, material and color – we even stock the super-hot Louis Vuitton Zippy wallet and hard-to-find denim models at unbelievably low prices. 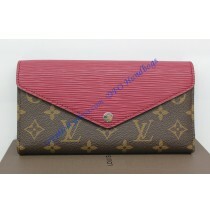 DFO Handbags prides itself on providing customer service that’s even superior to that of Louis Vuitton. Our LV wallets are so well-made that you will probably never need to have them repaired, but if you do, we’ll do the work free of charge. Shipping on DFO purchases is always free, and you don’t have to be considered a “valuable client” in order to receive prompt and courteous answers or assistance from our sales assistants at any time. 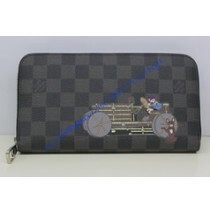 A Louis Vuitton wallet is the perfect way to show the world your appreciation for style and the status you’ve achieved. An LV wallet from DFO Handbags is the perfect way to have one – or more – of these prized fashion accessories at a price that’s easy on the wallet you’ve just purchased.